Hiroshima and Nagasaki- Shameful parts of American history | Jon Katz, P.C. First, the United States government threw west coast Japanese-Americans into barren concentration camps starting in 1942, urinating on their dignity and robbing them of their freedom, property, and careers. The United States Supreme Court shamefully approved it. Then, years later, the United States not only atom-bombed Hiroshima, but then Nagasaki three days later. 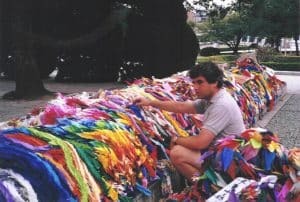 In August 1999 I visited the Hiroshima Peace Park, during my vacation, en route from Kyoto to Himeji Castle, thanks to the ease of the shinkansen/bullet trains. I folded some origami peace cranes in advance for this and other spots at the park. In the above photo — feeling discomfort to the pit of my stomach over being at the bombing site — I am leaving a peace crane either at the mound of ashes of 70,000 victims of the bombing or at the Sadako memorial. I know so many of the arguments for and against this bombing. The pro-arguments are diminished by the immediate atom-bombing of Nagasaki just three days later. The Hiroshima and Nagasaki atomic bombings are a shameful part of American history. Today I join my teacher Jun Yasuda in spirit, during this evening’s Hiroshima Day commemoration ceremony. Praying for the bombings’ victims, 70 years later. Na Mu Myo Ho Ren Ge Kyo.